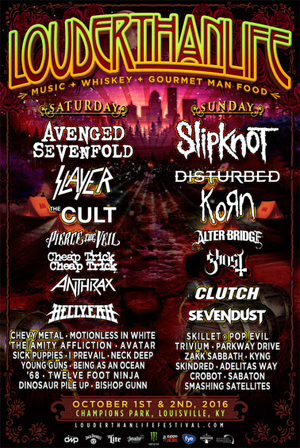 LOUDER THAN LIFE 2016 features SLIPKNOT and AVENGED SEVENFOLD--headlining together for the first time ever--topping a mindblowing music lineup of over 35 bands on three stages, with performances from DISTURBED, KORN, SLAYER, THE CULT, GHOST, Rock and Roll Hall of Famers CHEAP TRICK, PIERCE THE VEIL and many more. Festival attendees are also invited to the Chef Edward Lee Dinner With Shannon Gunz at the Wine Studio at 610 Magnolia Restaurant. The dinner will be held Friday, September 30 at 7:00 PM, will feature a specially created menu by Louisville’s very own celebrity chef Edward Lee, and will be hosted by SiriusXM’s Shannon Gunz. Purchase tickets HERE. Hotel discounts are available through Curadora HERE. 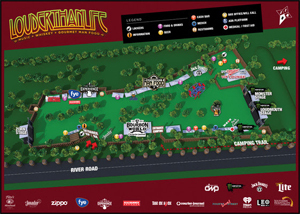 Camping and VIP packages can be purchased at www.LouderThanLifeFestival.com.